It’s time to get your spices organized!! Organizing your spices can make a big difference in your kitchen. 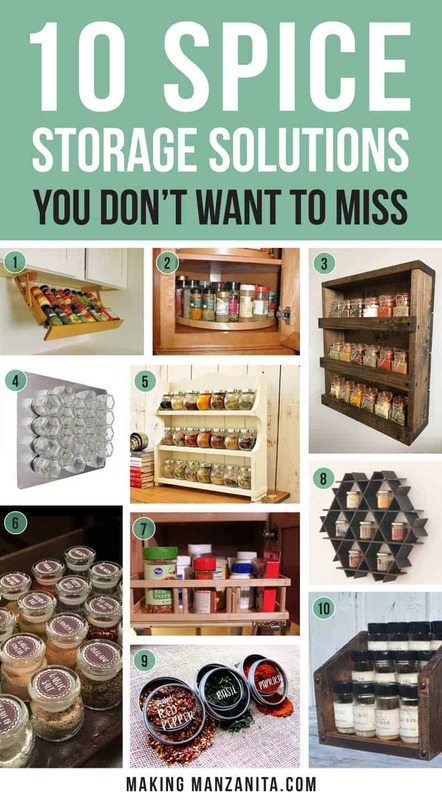 Bring a little efficiency and convenience to your kitchen with these 10 spice storage solutions you don’t want to miss! Last week I shared all about our spice cabinet organization and shared some free cut files for spice jar labels with you. It felt so good to get this little organization project done. Since we moved into our new fixer upper, things have been a bit of a mess. Having everything in such a disarray was killing me a little bit, so even a small win like organizing a pretty spice cabinet was a game changer. Since I’ve got spice storage on my mind, I thought I’d share some of my favorite ideas from Etsy with these 10 spice storage solutions you don’t want to miss. If you’re new here, welcome!! 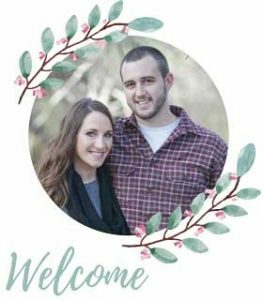 On the first of every month, I share a round up of Etsy products to encourage to you shop small! Buying from Etsy means you’re supporting small business owners and that’s totally awesome. If you want to keep the shop small thing going, check out the Making Manzanita Facebook page where I share my favorite “shop small find” of the week on Saturday mornings. This under cabinet spice rack easily and securely mounts under your upper kitchen cabinets and safely tucks away when not in use, freeing up valuable space and removing clutter. It keeps all of your spices lined up, easy to access and view. Stores up to 16 large spice containers, 32 smaller sized containers or a combination of both. The Split to Fit Lazy Susan is an problem solving addition to anyone who is looking to install a lazy susan in a kitchen upper corner cabinet. The spinning spice storage is 19 inches in diameter assembled, but allows you to pass it through a 10 inch wide door, now that’s efficiency!! Spice up your kitchen with this simple and rustic style solid wood spice rack. Keep your spices organized and within easy reach with lots of room for your favorite ones with the 3 shelves. These spice magnetic spice jars conveniently stick to your backsplash, side of cupboard or pantry door, saving space! With spices in sight, you can easily grab what you need—dishing up fabulous flavorful food! This farmhouse wood spice rack with 3 shelves allows you to display and access your spices while cooking at the kitchen. The upper shelf can even be used for larger jars as coffee or tea jars. It can be hung using hidden hangers at the back or just put it on the kitchen surface. This would look perfect in a farmhouse kitchen! Time to spice up your spice cabinet! These chalkboard spice stickers set includes 40 different spice/herb stickers. Each label is 1.5″ inches in diameter and is printed on high quality sticker paper. Couldn’t be any easier to get your spices organized with these stickers! Once you put in a sliding cabinet caddy, you will probably never want to take it out. This storage spice solution allows you to access spices in your upper cabinets with slide out convenience. You could even use it for alternative things like: medicine, first aid items, beauty and health, vitamins, craft supplies, etc. This sliding cabinet includes three adjustable dividers that make up to six compartments for storage. This geometric wall spice storage would go perfect in a home with modern decor. This wall rack could even hold coffee mugs, toilet paper rolls, stationary, toys and basically all the small stuff that you don’t know where to put! The shelf is made with recycled laminated cardboard coated with thin metallic foil for extra protection and durability and appearance. Put an end to those unattractive looking spice bottles that come from the store with these magnetic spice tins that can make a kitchen look awesome! The labels are completely customizable so you can choose which spices you want. They would look great on the side of the refrigerator or on a sheet of metal mounted to the wall! Each tin is 2.5 ounces with a lid that contains a clear, hard plastic. The back has a magnet attached so that it can be stuck to any metal surface. This spice rack was designed as a tiered “bleacher style”. It’s compact shape allows for more spices in less space. The spice rack can sit on a counter, or be put in a cabinet. 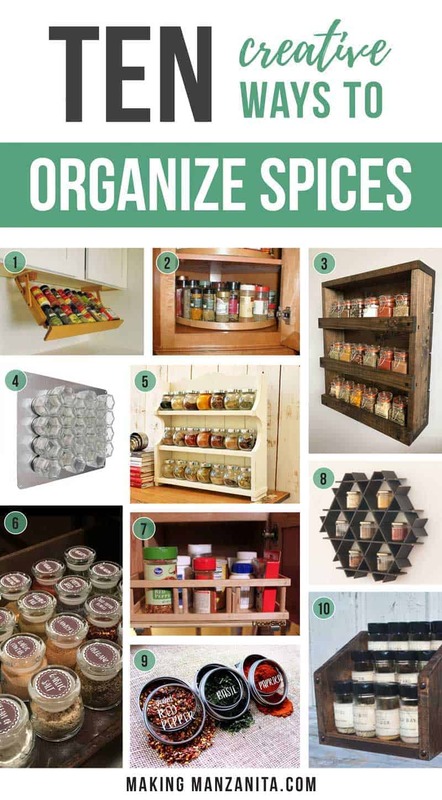 With all of these awesome spice storage solutions, there’s no excuse for you not to have a pretty organized spice area in your kitchen. As you can see, there are so many different options when it comes to getting your spices organized – you can keep them in a cabinet (like I did with our organized spice cabinet), display them on the wall or even on the side of your fridge with the magnetic options. Find a good spice storage solution that works for you and make it happen. I promise you’ll feel so much better after you organize your spices! Which of these spice storage solutions is your favorite? Love all these ideas. My spice cabinet is a disaster right now.